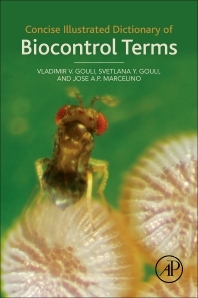 The Concise Illustrated Dictionary of Biocontrol Terms includes basic terminology related to the biological control of pests, together with state-of-the-art scientific and practical terms, for expedient comprehension and analysis of present, forecasted or in situ pest management problems. In addition, it also provides the names of the most common pesticides and predators commercially available in different continents (Americas, Europe, Asia, Australia, Africa), as well as target pests and diseases of these agents, making it a tangible tool for prompt management actions. The dictionary is copiously illustrated with original pictures clarifying the most commonly used terms and the identity of organisms in biocontrol technology, with content that is both scientifically rigorous and clear. The biological control of pests using living organisms, or products from their activities, is an independent branch of science based on multiple disciplines including general biology, zoology, entomology, phytopathology, microbiology and others. As a result, the field of biological control has its own specific terminology that needs to be understood and applied correctly across this variety of disciplines, including among those approaching the field from a different area of expertise and who may have difficulty understanding the terms used by experts in the field. This compact illustrated guide will appeal to the scientific community working in integrated pest management disciplines, as well as those researching, studying, and working with interest in protecting natural resources at a global, local, and individual level, in a variety of locations including the lab, garden, field, or forest. The scientific community working in integrated pest management disciplines, researchers with interest in protecting natural resources at a global, local and individual level, insect pathologists, biological control and integrated pest management specialists and practitioners in agriculture and plant/crop protection, public health and urban entomologists, undergraduate and graduate students and their instructors in the above areas. Dr. Vladimir Gouli is a renowned scientist in the field of invertebrate pathology and biological plant protection, a former Head of the Department of Microbial Pest Control at the All-Union Research Institute of Biological Plant Protection, USSR, and currently a Professor in the Plant and Soil Science Department at the University of Vermont. Dr. Gouli has authored or co-authored more than 250 publications in English, Russian, 13 books in Russian, Ukrainian, Japanese, Chinese, Romanian, English, and holds 16 patents in Russia, one patent and two provisional patents in the United States. Dr. Svetlana Gouli is an Entomologist, Insect Pathologist, and Research Associate in the Entomology Research Laboratory at the University of Vermont. She has more than 30 years’ experience in insect pathology and biological control of insect pests, with more than 100 scientific publications, including two books, in the field. For the past decade she has trained graduate students and international specialists in the basic principles of mycology and microbiology, with special attention to mass-production of entomopathogenic fungi. Dr. Jose Marcelino is a Postdoctoral Fellow at the University of the Azores, with a PhD in insect pathology and genetics. He has researched and worked on the epizootiology of important pests of Northeastern USA, as well as genetic profiling of mycopathogens and insect pests, with nearly 20 publications in the field. His fields of research include macroecology, entomology, insect and plant pathology, conservation, and phylogenetics.